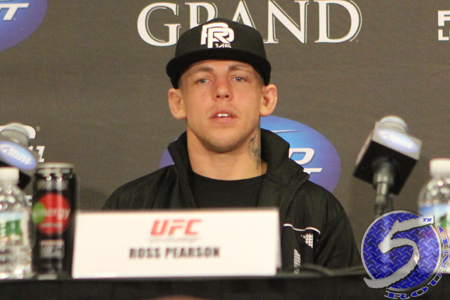 On Friday, a lightweight shootout between Ross Pearson (pictured) and Diego Sanchez was announced to the UFC Fight Night Albuquerque lineup. Sanchez is looking to bounce back from two straight losses, including this month’s lackluster unanimous decision defeat to Myles Jury at UFC 171. “Dream” has dropped five of his past eight scraps. Pearson, meanwhile, hasn’t fought since October’s no contest with Melvin Guillard. The Brit had won two consecutive prior to that outing. Tingley Coliseum in Albuquerque, New Mexico hosts the June 7 festivities. No word if the event will be made available for live viewing on UFC Fight Pass, Fox Sports 1, Fox Sports 2 or a combination of the three.